In this dark tale, the Bard's most famous heroes embark upon a journey to discover a long-lost soul. Hamlet, Juliet, Othello, Falstaff and Captain Cesario search for a reclusive wizard who may have the ability to assist them in their battle against the evil forces lead by the villains King Richard III, Lady MacBeth, and Iago. That reclusive wizard? William Shakespeare. 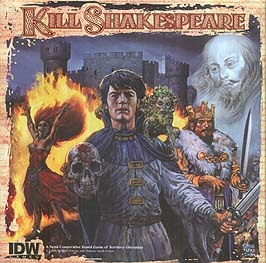 InKill Shakespeare, you and your friends will join together to free the kingdom from the clutches of Richard III and his forces. You will compete to liberate cities, remove his influence from the land, and complete quests to wrest control from the vile King Richard. you will use your own influence to grow your army and steal troop-movement letters and city plans in order to liberate the cities that have been occupied by Richard and Lady MacBeth's forces. You must be careful, however, because not all your companions can be trusted. You must beware the vile Iago, who will steal your own plans and report your troop movements to your sworn enemies. Throughout the game you will be given quests by the likes of Puck, Shakespeare and other favourite characters from the pages of William Shakespeare's great plays. These quests and events will weave a deep narrative created by the writers of the Kill Shakespeare comic book that will bring you even deeper into the engrossing world of the award-winning comic series. While only one of the heroes can rule the day, you will need to work together to ensure that Richard doesn't overrun the realm, that Lady MacBeth doesn't ensnare your rebellion, and that Iago doesn't gain the knowledge of Shakespeare's whereabouts. In this world, your enemies have a single goal - Kill Shakespeare. It's up to you and your friends to battle for the Bard.